Please note, solutions are available here. Create three vectors x,y,z with integers and each vector has 3 elements. Combine the three vectors to become a 3×3 matrix A where each column represents a vector. Change the row names to a,b,c. Think: How about each row represents a vector, can you modify your code to implement it? Please check your result from Exercise 1, using is.matrix(A). It should return TRUE, if your answer is correct. Otherwise, please correct your answer. Hint: Note that is.matrix() will return FALSE on a non-matrix type of input. Eg: a vector and so on. Create a vector with 12 integers. Convert the vector to a 4*3 matrix B using matrix(). Please change the column names to x, y, z and row names to a, b, c, d.
The argument byrow in matrix() is set to be FALSE by default. Please change it to TRUE and print B to see the differences. Please obtain the transpose matrix of B named tB . Now tB is a 3×4 matrix. By the rule of matrix multiplication in algebra, can we perform tB*tB in R language? (Is a 3×4 matrix multiplied by a 3×4 allowed?) What result would we get? As we can see from Exercise 5, we were expecting that tB*tB would not be allowed because it disobeys the algebra rules. But it actually went through the computation in R. However, as we check the output result , we notice the multiplication with a single * operator is performing the componentwise multiplication. It is not the conventional matrix multiplication. How to perform the conventional matrix multiplication in R? Can you compute matrix A multiplies tB ? Extract a sub-matrix from B named subB . 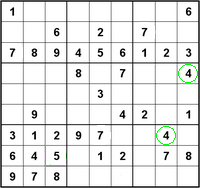 It should be a 3×3 matrix which includes the last three rows of matrix B and their corresponding columns. Compute 3*A , A+subB , A-subB . Can we compute A+B? Why? Generate a n * n matrix (square matrix) A1 with proper number of random numbers, then generate another n * m matrix A2. If we have A1*M=A2 (Here * represents the conventional multiplication), please solve for M.
Hint: use the runif() and solve() functions. E.g., runif(9) should give you 9 random numbers. Image: “200px-Sudoku06u” by DrBorka from nl. Licensed under CC BY-SA 3.0 via Wikimedia Commons.